The use of animals to test cosmetics has been a sore point for many consumers for a long time. Animal-protection organisations from around the world have worked tirelessly to end animal testing for cosmetics and, though the journey is far from over, they’ve had some success in getting it banned in some countries. People often ask about cosmetic brands and testing, ultimately wanting to buy cruelty-free products, but many not knowing where to look, or what to trust. Here’s our guide to beauty without cruelty. To market a product, cosmetic companies are required by consumer protection laws in most countries to show that their product is safe to use, is not toxic and poses no danger to public or environmental health. This includes showing that the ingredients are not dangerous in large quantities, such as when in transport or in the manufacturing plant. In some countries, it is possible to legally meet these requirements without any tests on animals. However, many of these countries still conduct animal testing even if there is no legal requirement to do so. Other countries, such as China, require animal testing simply to meet legal requirements. Some big name companies who have not tested on animals are now selling or planning to sell products in China. This means animal testing. Any company that sells its products in China is directly or indirectly conducting animal testing, as it is a legal requirement in China – and it is not a cruelty-free brand. April 2014 update: There has been a breakthrough in Chinese regulations opening the door to non-animal testing of cosmetics. In June 2014, new Chinese Cosmetics Regulations are likely to come into force, which may exempt domestically manufactured ‘ordinary use’ products such as shampoo, soap and lipsticks from the pre-market animal tests. ‘Special use’ products such as skin whiteners, hair dyes and sunscreen will not be exempt. The legislation that governs cosmetics testing throughout the European Union (EU) is the 1976 Cosmetics Directive (76/768/EEC). After many years of campaigning by various animal-protection organisations, EU law was eventually changed in 2009 to ban the use of animals to test cosmetics or any of their ingredients. Another new law came into effect on 11 March 2013 that bans the sale of new cosmetics in the EU that have been tested on animals in other parts of the world. It means that no company can carry out new animal tests for cosmetics outside of the EU for products to be sold in the EU. If a product has ingredients which have been animal tested after the ban comes into effect, a company will not be able to market this in Europe, even if it sells the same product in any other country outside of the EU. However, companies can still carry on animal testing cosmetics outside the EU where these cosmetics are also sold outside the EU. This opens up the possibility of a company conducting animal tests for ingredients in some markets (e.g. China), but using non-animal methods and existing data for the EU market. There are also a number of outstanding issues with the EU’s Cosmetics Regulation text which are yet to be clarified. So, it’s not a home run just yet. The sale of animal-tested ingredients used in cosmetics and household products is scheduled to be banned in Israel in 2015. How Do I Find Cruelty-Free Cosmetics? To shop cruelty free, look for the Leaping Bunny logo on products! To guarantee you’re getting cruelty-free products, the British Union for the Abolition of Vivisection (BUAV) has a handy cruelty-free shopping guide. It’s international and you can search by country, brand and type of product. BUAV certification enables consumers to easily identify and purchase cosmetic and household products that have not been tested on animals. 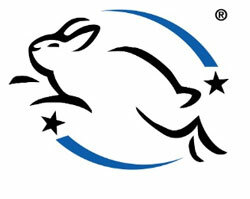 The Leaping Bunny logo is the only bunny mark that guarantees the product is cruelty free. Don’t be mislead by companies using other pictures or logos of bunnies to imply that they’re cruelty free! Each company has to be open to an independent audit throughout its entire supply chain to ensure that it adheres to BUAV’s strict standards and criteria. The monitoring of a company continues once they are approved – so, should a company fail to meet the requirements at any point, they’ll instantly lose their Leaping Bunny certification. Be aware that some companies claiming to be cruelty free may be telling porky pies! Aware of consumer feelings on animal testing, some companies use legal loop holes to take liberties with the language they use on their packaging. As the legal definitions for terms such as “cruelty free” and “not tested on animals” are not defined, companies can make highly misleading statements on their product labels. The highly misleading “not tested on animals” claims on product packaging or a company’s website may mean that the final product has not been tested on animals, but hides the fact that the ingredients have. Also, some companies may not directly carry out animal testing themselves, but employ a third-party to do it for them. Another label to watch out for is “against animal testing”. This statement means nothing and it does not guarantee that the product and all its ingredients are free from animal testing. The same misleading statements can be found on companies’ websites. Statements like “no animal testing unless required to do so by law” means that the company may (directly or indirectly) test on animals to sell in certain countries. Makeup brushes are traditionally made from animal hair. Sable, badger, pony, squirrel and goat-hair brushes all come from animals. There’s no reason to use animal hair brushes these days – lots of good quality, super soft synthetic makeup brushes are available. Synthetics are devoid of any protein component – so it’s totally vegetarian and vegan friendly. The fibres don’t have a cuticle, making it more hygienic than animal hair as it is less likely to trap bacteria, skin or makeup particles and it’s easier to clean. To market a cosmetic product, a company must demonstrate its safety. This can be done by using existing ingredients that have already been established as safe for human use and by carrying out approved non-animal tests. Some of these tests include human cell in vitro toxicity screening, real human guinea pigs, computer simulations and human skin grown in the lab. Without any animal testing, we can still produce a huge range of safe, effective and high-quality cosmetic products. After all, there are lots of cosmetic companies out there doing this already. I know Joanne. So many of our fave brands recently decided to go into China, and, bang, that was the end of their non-animal testing status. And the end of our buying their products. Sod ’em!